Blackstone Audiobooks presents, from the unabridged collection A. 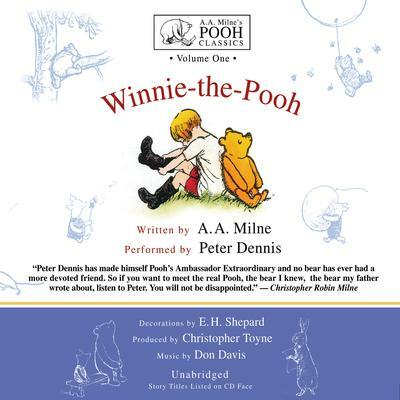 A. Milne’s Pooh Classics, the ten stories of Winnie-the-Pooh performed by Peter Dennis. Wonderful bringing to life of the children's classic. Wonderful bringing to life of the children's classic.Peter Dennis is indeed a wonderful ammassador of Pooh. A perfect book to the child of all ages. Love this! Great sound effects, and humble tones make this very delightful to listen to! This is a great listen for people at any age. Peter Dennis captures Winnie-the-Pooh and his pals. I listened to this when I was older than the young kids this book is geared towards and I STILL enjoyed it. I think the narrator did a wonderful job with the characters (though sometimes a little over-the-top with the Piglet character, but that's just my personal opinion). He lends the perfect amount of distinction and animation to each character and keeps you drawn into the charming story. I would recommend it to children and adults alike.